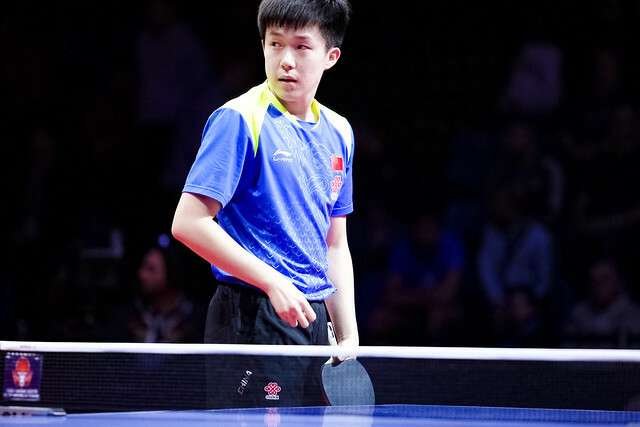 Matters underway at the Seamaster 2019 ITTF World Tour Hungarian Open in Budapest on Thursday 17th January; from the very start there were upsets. Players who had been required to compete in the qualification tournament seized their opportunities. Furthermore for the host nation, early success was balanced with defeat later in the day. …………Hong Kong’s Wong Chun Ting and Doo Hoi Kem, winners one month earlier at the Grand Finals in Incheon and the top seeds in Budapest, suffered a first round mixed doubles defeat. They were beaten by the French partnership of Tristan Flore and Laura Gasnier (13-11, 9-11, 11-7, 11-7). …………There was cause for the host nation to celebrate in the opening round of the women’s doubles event. Georgina Pota partnered trusted tried and trusted colleague, Sweden’s Matilda Ekholm, to success against Romania’s Irina Ciobanu and Adina Diaconu (13-11, 8-11, 12-10, 11-6). …………Reigning European champions, Austria’s Daniel Habesohn and Robert Gardos suffered a first round men’s doubles defeat. They were beaten the French pairing of Tristan Flore and Emmanuel Lebesson (6-11, 11-6, 16-14, 11-5). …………A break of one year from the international scene, Germany’s Shan Xiaona displayed the fact that her talents were not diminished; in the opening round of the women’s singles event, she caused a notable upset, she beat Hong Kong’s Doo Hoi Kem, the no.7 seed (5-11, 11-8, 11-5, 7-11, 11-8, 11-5). …………Gold medallist at the 2014 Youth Olympic Games, China’s Liu Gaoyang underlined her undoubted potential. In the women’s singles opening round she caused the defeat of the biggest name to fall. She overcame Singapore’s Feng Tianwei, the no.5 seed (11-8, 9-11, 15-13, 11-5, 11-6). …………Dramatic contests, none was more dramatic than the victory recorded by Romania’s Bernadette Szocs, the no.10 seed, in opposition to Chinese Taipei’s Cheng Hsien-Tu; in her opening women’s singles contest the Romanian emerged successful by the very narrowest of margins in the seventh game (11-9, 8-11, 9-11, 13-11, 1-11, 16-14, 15-13). …………Disappointment for the host nation accrued as the day progressed, in the opening round of the women’s singles event Georgina Pota, the no.15 seed, lost to India’s Manika Batra (10-12, 12-10, 11-9, 6-11, 11-8, 8-11, 12-10), Dora Madarasz, the no.16 seed, suffered at the hands of Portugal’s Fu Yu (11-5, 11-9, 11-9, 9-11, 6-11, 11-5). Similarly in the men’s singles, Bence Majoros, the no.16 seed, experienced defeat when facing Russia’s Alexander Shibaev (11-8, 11-8, 11-3, 11-7). …………Top seed and defending champion, Fan Zhendong made a most impressive start in his quest to retain the men’s singles title. In the opening round, he beat Kazakhstan’s Kirill Gerassimenko (8-11, 11-2, 11-4, 11-5, 10-12, 12-10). A hard fought six games win, it was even harder for Chinese national team colleague Xu Xin; he needed the full seven games to overcome Germany’s Benedikt Duda (11-5, 11-3, 7-11, 11-5, 11-3, 13-15, 11-5). …………Defending women’s singles champion, Wang Manyu made the ideal start to her campaign; the no.3 seed, she ended the hopes of colleague Chen Ke in four straight games (11-7, 11-7, 12-10, 11-4). …………The top two seeds in the women’s singles event both imposed their authority on proceedings; China’s Zhu Yuling and Chen Meng were not to be denied. Zhu Yuling beat colleague He Zhuojia (11-6, 11-6, 11-2, 13-11); Chen Meng accounted for Singapore’s Yu Mengyu (11-5, 11-8, 11-6, 11-6).